President Alfredo led the group in the Four-Way Test. We had 11 members present today. Our Rotary Moment today was about an experience Alfredo had this past Christmas. He received a Christmas card from a client and in the envelope, instead of a lump of coal he found a $150 donation to our club's foundation! Talk about an original and thoughtful present. * This year we will be having another fundraiser for Project Amigo, more details coming in the month of March. 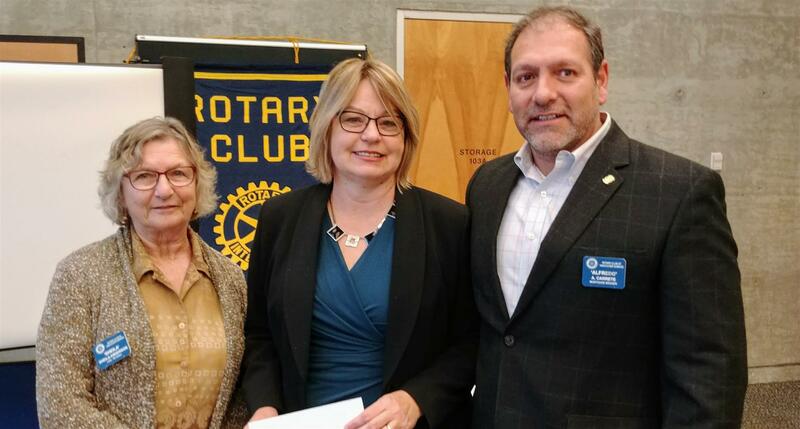 Our guest speaker today was Jackie Kloosterboer who is the Emergency Planning Coordinator & Emergency Social Services Director with the city of Vancouver. Jackie has been leading the way in earthquake preparedness for over 18 years. She presents more than 100 Earthquake Preparedness sessions each year to groups, businesses and at conferences, taking people step by step through the process of how to prepare their family and pets for whatever disaster comes their way. Jackie is often interviewed by a variety of media outlets across Canada as she promotes Earthquake Preparedness. 1) Have an out of Province emergency contact. You may not be able to contact all your friends and family locally due to the communications services being unavailable or limited. 3) Budget 4 liters of water per person per day. Jan 10 - Business Meeting. Jan 17 - Advanced Education, High School Graduates' next move.